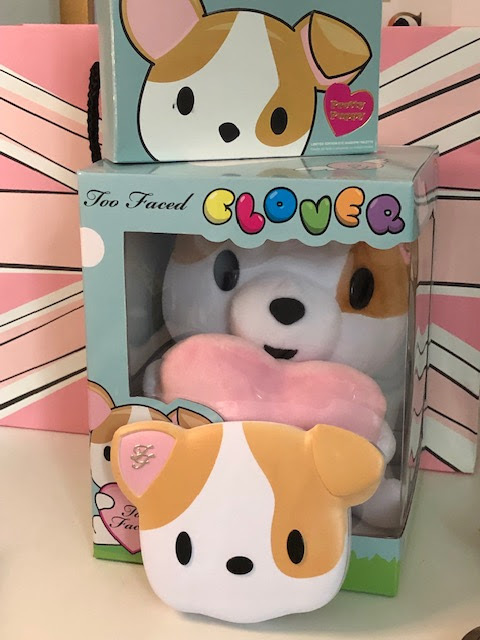 As you all know by now I am a bit of a saddo and 100% a packaging trollop so when I spotted this Baby on the Too Faced Website I was tempted to have it shipped from the states, I didn't need to stress as it was available in the Too Faced stores here in the UK, I got mine as usual in Bluewater, here's the thing, a few weeks back I picked up the Clover soft toy (I told you I was sad) and him indoors wanted to know if it was as a gift to my Granddaughter! No! I love you babe, but you know how I am about Too Faced. This time round when picking up the Puppy shaped palette he just raised and eyebrow and paid lol. I could not leave this in the shop as it's the cutest thing on the planet, disregarding how it looks it really is a versatile palette with a mix of 6 matte and shimmer shades in totally wearable colours, as always with Too Faced the pigments are stunning as is the blendability - I don't even know if that is a word! but you all know what I mean. As always with Too Faced there is a fabulous fragrance of delicate Chocolate.